We are looking forward to our 2019 season which started about two weeks ago. 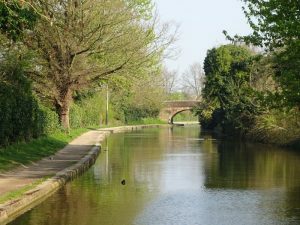 Departing our winter mooring at Wigrams Turn Marina on 26 March, we headed up to Warwick. The two of us “practised” doing locks – 25 of them – before arriving at the Saltisford Canal Centre in Warwick. Our first guests of the year joined us here on 28 March. Warwick is one of the many places on our routes which is well worth a visit. Our guests had some time to spend in Warwick before we headed back down the canal and on to Braunston. The weather was outstanding for the end of March – one day we had lovely sunshine and 18 degrees C – hopefully it will stay this way (not likely though I am afraid). It is wonderful to see the colours of the flowers and the lambs frolicking about. Spring is certainly with us. From Braunston we headed down the Grand Union Canal towards London passing through the tunnels at Braunston and the longer tunnel at Blisworth. The stretch in between the tunnels is very much countryside although we do see the M1 motorway, A5 Ermine Street and Midland Mainline for a short time. Sometimes we may even be going faster than the traffic on the M1 !! 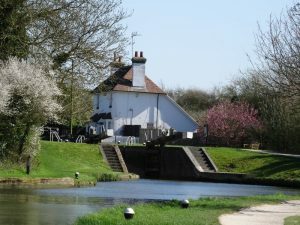 At Stoke Bruerne our guests had some time to take in the sights and visited the Canal Museum, again well worth a visit. From there we continued our journey around Milton Keynes before stopping for another visit, this time at Bletchley Park, known for the WW2 code breaking. We continued to Linslade (Leighton Buzzard), where this is being written. From here we will continue south and up the Marsworth flight of locks, always one of our favourite flights, before transiting the summit at Tring. On previous years we have seen kingfishers here so let’s hope this year is going to be good for us. We then head down to the lovely town of Berkhamsted. 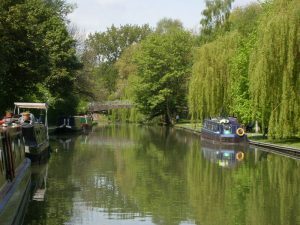 Two of our guests will depart Kailani here, with the others continuing to Kingston on the Thames. Their journey will have been the longest anyone have travelled with us on a single trip. From Warwick to Kingston is 117 miles – well done, Ian and Pat. See you again soon. The routes for the remainder of 2019 and our 2020 season can be seen on the Kailani web site.